The Bay Trail will close overnight between Willow Road and Chilco Street starting Wednesday, April 3, at 9:00 pm and reopen Thursday, April 4, at 6:00 am. The closure is necessary to complete work that will realign the Bay Trail around the future bayfront bicycle/pedestrian bridge. This will allow the Bay Trail to remain open for the duration of the bayfront bridge construction. Signage is already in place and barricades will also be installed. 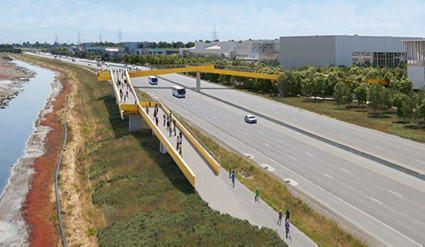 The bicycle/pedestrian bridge across Bayfront Expressway is being constructed by Facebook as a requirement from the City of Menlo Park. The project’s goal is to improve pedestrian and bicycle access across Bayfront Expressway from Menlo Park’s Belle Haven neighborhood to the Bay Trail and the Don Edwards San Francisco Bay National Wildlife Refuge. The bridge will have ramps on both sides of the expressway and the northern bridge landing will provide the community with an overlook platform to the wildlife refuge. The bridge design aims for minimal impact to the refuge and endangered species by limiting permanent and temporary intrusions and incorporating anti-perch measures against birds of prey. This helps provide for protection of snowy plovers, small shorebirds that dash in and out of the water’s edge. The bridge construction is scheduled to begin in May 2019 with completion expected in mid-2020. For more information about the Bay Trail closures or the bayfront bicycle/pedestrian bridge project, please contact Acting Principal Planner Kyle Perata.